The crown of Edinburgh is Arthur's Seat! Edinburgh is just around 3 big volcanoes. However today all 3 are dormant and atop one is the Arthur's Seat! Arthur's Seat is atop the Holyrood Park that's just behind the Holyrood Palace in the Old Town. There are about 4 known routes through the Holyrood Palace though practically any way can be taken to climb atop. There are 2 paths that separate behind the Holyrood Palace. I took the one on left. Ideally even going by that route, one path just takes a round the park without touching the peak, and another path that takes a diversion almost towards the end and takes a path to the peak. The path is mostly a dirt track but pretty much wide. I saw a few senior citizens too making their way atop on this!!! From the peak at 250m, the view is just spectacular!!! On one side are the mountains which also has the first ever man-made ski slope and on another side are 2 more dormant volcano hills with small lakes beneath and on another side is the huge North Sea that forms a bay into Scotland!!! From the top for the descent, you could actually go on any direction. 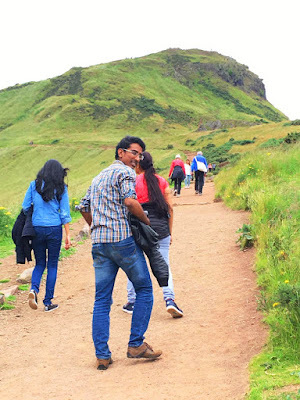 The easier way is to go on the path which was taken to reach atop and the take the left to connect on the path that ends behind the Holyrood palace. However we didn't want to take that route and took the steeper route on the opposite side. From here its literally rocks laid out in a path-like formation. Its steep and slightly trekking type route. And guess what, going down on this, this too connected to the 2nd path behind Holyrood palace. It was the perfect path in my opinion!!! The whole thing took about 2.5hrs and was definitely worth it. The cell phone gets signal all through the path and atop as well. Obviously GPS too has signal so its impossible to get lost. The best part is even the dirt track shows on Gmaps! 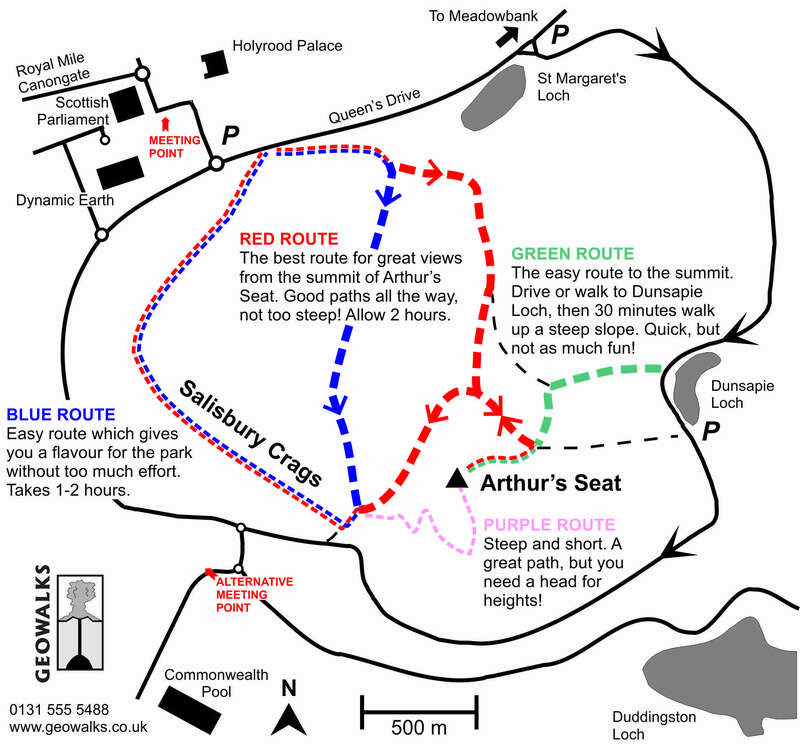 The easiest route to reach atop takes only about half an hour from the Dunsapie Loch which can be reached on road. From half way through the climb in a particular view I saw a Parthenon type Greek styled building and I set off to this place next. This tiny hill is the Calton hill which is in the New Town. This is a no-brainer climb that even a couch potato could do. There is a paved black topped shallow inclined path that reaches atop. Its infact wheelchair accessible. Atop here are a couple of buildings. One is the Nelson monument which is a tower which could be climbed. But since we reached late in the evening, it was already closed. Another small circular monument here atop is called the Dugald Stewart Monument. There is an observatory atop and this huge monument that I saw from Arthur's Seat is the National Monument of Scotland which was built to commemorate the soldiers who died in the Napoleonic Wars! P.S: Thanks to Amanda of Love & Other Awesome Stuff who helped me out with practical info on this place before I ventured here! I love all the outdoor places you feature especially that you can really see the prevalent green backdrop. There's also a lot of heritage here. I really find it amazing how certain places preserve such beautiful structures. It's something that people would really be interested to see in the place indeed. I also like the place itself. I bet it is really comfortable walking there. The view from the top is absolutely breathtaking and it's so nice to see all the buildings from below! The perfect place to just get some quiet time. I would love to go here someday and just savor the view. Scotland looks more beautiful than London? May be you want to write one comparison post...I loved your outfit. Such a beautiful place to explore. Must have been a real fun experience. And the photos are indeed great. Happy traveling and hope you share with us more places. Your photos remind me of my scotland tour- Edinburgh, Loch ness were so beautiful and picture perfect place. This would be my dream destination! I love historic places!